I've done several watercolor florals on Masa paper, and I love the effect. But ever since I saw Cheng Khee Chi's landscapes on Masa, I've wanted to try one. 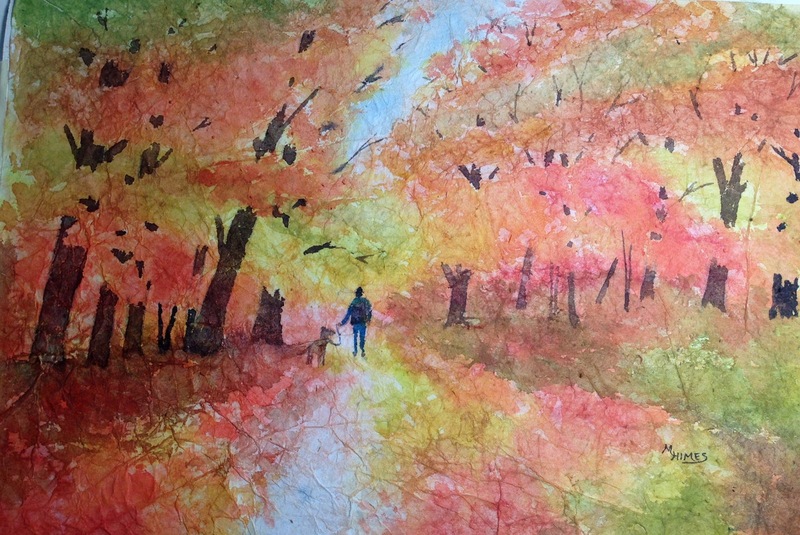 Here is my fall landscape, with my daughter and grand-dog taking a walk in the distance. This is a semi-abstract of some flowers that I found in our church courtyard. I painted them wet-in-wet - inspired by the techniques of Karlyn Holman. Painted several weeks ago. 11 x 15. I started this at my friend Anna's house, using her flower arrangement for a model. My idea was to do it in a style made famous by Karlyn Holman. I REALLY struggled with this painting. I pulled it out in the end, but I'm not entirely happy with it. I've used this subject before, and maybe this title too. These tulips lend themselves to experimentation, and this is a new design that I tried, imspired by the work of K.Holman. 11 x 15 on Arches. I decided to try my hand at doing an abstract the other day. I was inspired by watching a video by K.Holman. I've not been too successful at these, so I don't try too often, but I had a lot of fun with this one. Halfway through, it reminded me of fireworks, and when it was done it looked more like balloons, so I titled it "Celebration". This is 15 x 22 on Arches, textured with coffee filters, saran wrap, and gauze. I sketched this iris yesterday in my backyard, in my 9 x 12 Super Aquabee sketchbook. Almost every year around Christmas I buy an amaryllis plant, and right after the new year I plant it and watch it grow. I love the big colorful flowers, and I enjoy sketching and painting it. Most of the time there is a second blooming after the first one dies out. Waiting to see if that happens. I am a watercolor artist living in New Jersey. 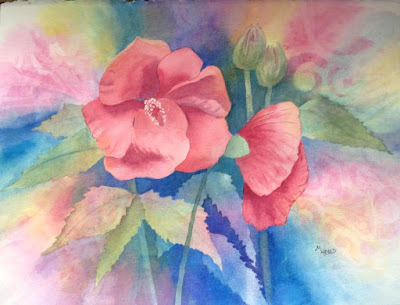 I am a member of the North East Watercolor Society, the New Jersey Watercolor Society, and several local and internet art organizations through which I exhibit my paintings. My favorite subjects are close focused florals and landscapes. I've recently begun teaching a beginning watercolor class at our local senior center. The artwork on this blog is protected by copyright law. Any use without the expressed consent of the artist is prohibited.